Once you reach Cork, you’ll soon realise why it’s known as Ireland’s gourmet county. With seafood so fresh that it glistens, lively farmers’ markets, excellent local produce and a glut of critically acclaimed restaurants, you’re never too far away from something flavoursome. But beyond the epicurean delights and gastronomic pleasures lies a countryside that comes alive with fascinating history. West Cork boasts some of the Ireland’s most exceptional scenic treats with a craggy coastline and broad golden beaches, while Cork’s charming towns and villages are the perfect place to nestle down with a pint of locally brewed Murphys! Blarney Castle, Woollen Mills and the famous Blarney Stone. Midleton Distillery – Home to Jameson whiskey and the renowned Midleton whiskey. Cape Clear & Sherkin Island – Ireland’s most Southerly inhabitated islands. For anyone that loves the great outdoors, Kerry is a dream destination. This charming county has it all, with truly sublime scenery, exceptionally friendly locals, internationally renowned spas, gorgeous little villages and excellent restaurants. Kerry’s exceptional coastline is a series of peninsulas that open out into larger bays and give a totally unique feeling to the county, with craggy hills that tumble down into the choppy ocean below, and a remote, untouched aspect to the land. A drive around the Ring of Kerry or the Ring of Beara, which crosses the border into Cork, is an unforgettable way to experience the best that this awe-inspiring landscape has to offer. But if all that feels like too much hard work, then head to one of the utterly lovely villages like Sneem, Kenmare or Dingle and wile your afternoons away eating fresh seafood, drinking creamy pints and listening to some utterly authentic traditional music. The Blasket Islands – See the visitor centre on the mainland or take a boat trip to the islands. 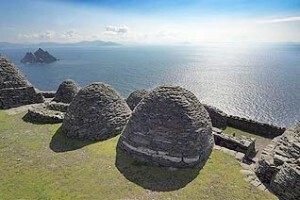 The Dingle Peninsula – A looped drive that takes inn the rugged coastline. Crag Cave: These caves are thought to be over one million years old.